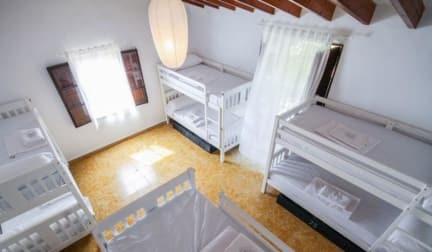 Sa Fita Backpackers - Albergue Juvenil i Palma de Mallorca, Spania: Bestill nå! Set in Esporles, Sa Fita Backpackers - Albergue Juvenil xijib/009. The perfect place for travellers who love nature, hiking and discover the island. 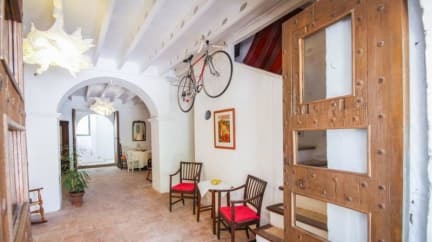 Quiet house in a quiet and authentic majorcan small town in the heart of Serra de Tramuntana. We offer shared rooms of 6, 8, 10 people. All the hause is common area. Kitchen, bathroom, TV room, reading area, Wi-Fi, big terrace with small plunge pool and orchard. Shampoo and gel, towels, sheets and hair dryer is included. Personal attention every day until 22:00h. Is a pleasure to help and inform our visitors about all the activities and places you can enjoy in Mallorca. Hiking, cycling, kayak and much more. Esporles is the perfect place for all preferences and ages. Is possible play sports, enjoy the beach, hiking... Perfect for groups of friends, families or by yourself. Palma de Mallorca is 13 km from Sa Fita Backpackers. The nearest airport is Palma de Mallorca Airport, 24 km from the accommodation.